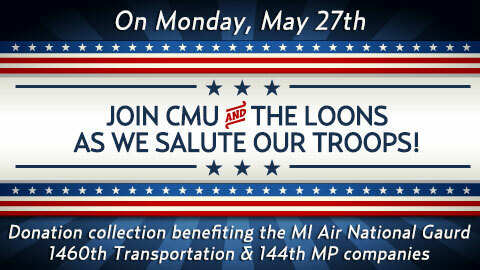 MIDLAND, Mich. - As part of their Memorial Day Celebration, presented by Central Michigan University, on Monday, May 27, the Great Lakes Loons and CMU will be partnering to collect items that are needed by members of the United States military. Fans are encouraged to show their support for American troops by bringing an item with you to the Memorial Day game. All collections will be packaged and shipped to the 1460th Transportation & 144th MP companies. Collection points will be set up at both entrances to Dow Diamond and cash donations also will be accepted. For anybody that is unable to attend the game, items can also be dropped off at Dow Diamond between 9 a.m. and 5 p.m., Monday through Friday. Gifts and packages will also be collected at CMU University Communications between 9 a.m. and 5 p.m., Monday through Friday, until May 31. The Loons will take on the Dayton Dragons at 3:05 p.m. on Monday, May 27, as part of Memorial Day Celebration. It will also be a Social Media Monday at Dow Diamond. Fans can interact with the Loons on Facebook, Twitter and the Loons new Boomaphone app during the game to request songs, win prizes and compete in on-field contests. 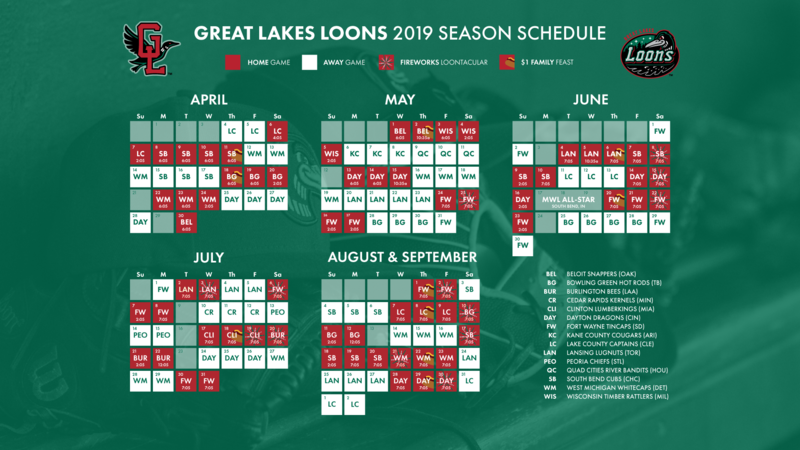 The Great Lakes Loons are a seventh-year Single-A partner of the Los Angeles Dodgers. For tickets and more information about the Loons, visit Loons.com or call 989-837-BALL.